Supertouch® are one of the most recognised names within the UK Hand Protection and Workwear industry. This year sees the expansion of their disposable gloves range with the introduction of two new products: Vynatrile® and Flexo®, but how do they compare to the ‘standard’ materials? Latex has traditionally been the material of choice for both medical and industrial disposable gloves due to it’s unrivalled dexterity, however allergies to latex are prevalent amongst both the general population and healthcare professions. New advances in material technology are closing the gap between latex and synthetic materials resulting in excellent quality, allergy-free alternatives. 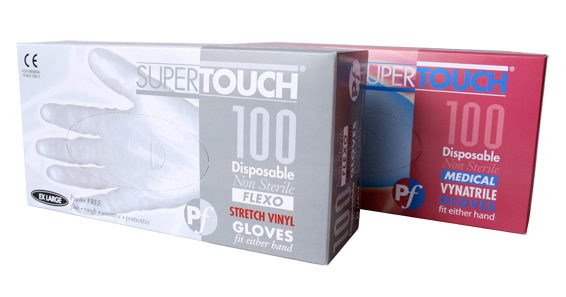 Supertouch® are now introducing two new products to their disposables range. Vynatrile® gloves are made from a combination of both vinyl and nitrile and offer the advantages of both materials. Vynatrile® gloves offer strength, protection and a snug fit combined phentermine 37.5 online buy with the sensitivity and lower cost offered by their vinyl counterparts, making them perfect for non-sterile medical use. Flexo® gloves are a synthetic vinyl glove also known as “stretch vinyl”. Again, these gloves bridge the gap between traditional vinyl and latex gloves in order to create a worthy alternative to both latex and nitrile. Whilst still cheaper than nitrile, these Flexo® gloves offer superior fit, sensitivity and tensile strength making them a strong contender for both medical and industrial use. As both Vynatrile® and Flexo® are made from synthetic materials and are 100% latex-free, they pose no allergy risk. These gloves are the ideal choice for encouraging an allergy-free environment without compromising on quality, comfort or protection. For more information, please call us on 0845 130 9922 or email sales@supertouch.com.